316L 14GAUGE 7/16" DOUBLE GEM BANANA BELLY RINGS WITH HOOP TO "ADD YOUR OWN CHARM." GET CREATIVE AND "ADD YOUR OWN CHARM" OR DANGLE TO THESE 316L BELLY RINGS. BLACK TITANIUM ANODIZED LARGE 7MM SIZED C.Z. SHAPE BELLY RINGS.COMES IN 7MM ROUND,7X7 SQUARE,7MM HEART AND 7X7 STAR.TOP QUALITY 316L SURGICAL STEEL BLACK TITANIUM ANODIZED 14G 3/8" (10MM) LENGTH SHAFT. 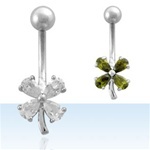 Clover Gem Belly Ring. TOP QUALITY 316L SURGICAL STEEL 14 GAUGE 3/8" (10MM) LENGTH BAR. THIS UNIQUE DESIGN USES THE SHAFT OF THE BELLY RING AS THE BODY OF THE DOLPHIN,SO WHEN WORN IT LOOKS LIKE THE DOLPHIN IS JUMPING OUT FROM YOUR BELLY BUTTON.IT IS VERY CUTE.TOP QUALITY 316L SURGICAL STEEL 14G 7/16". TOP QUALITY 316L SURGICAL STEEL 14 GAUGE 3/8" (10MM) LENGTH BAR. AVAILABLE IN BLACK SKULL BELLY RING, GEMMED SKULL BELLY RING, GIRLY SKULL BELLY RING, HEART SKULL BELLY RING, WINGED SKULL BELLY RING, OR SKULL OR BONES BELLY RING. REAL 14K GOLD PLATED BEZEL SET C.Z. BELLY RING.TOP QUALITY 316L SURGICAL STEEL WITH 14K GOLD PLATING. 14 GAUGE 7/16". AVAILABLE IN GOLD CIRCLE CZ BELLY RING, GOLD HEART CZ BELLY RING, GOLD SQUARE CZ BELLY RING, OR GOLD STAR CZ BELLY RING. Available in Snowflake Obsidian, Green Jade, Tiger's Eye, Tree Agate , Opalescent Moonstone , Turquoise	, Rose Quartz, or Lapis Lazuli HAND PAINTED BUTTERFLY BELLY RING.TOP QUALITY 316L SURGICAL STEEL 14 GAUGE 3/8" (10MM) LENGTH BAR.